Every so often my irritation with the news media boils over. This is one of the cases that blatantly exposes there is some agenda in the mainstream media. Whatever you may decide it is, it isn’t about saving the planet. Posted in Bizzare, Interesting. Tagged Climate. Crap. I’m coming down with a cold… sniffle, sniffle, hack, hack… need more chocolate. So, I’m browsing through the Second Life™ related blogs finding things I think are neat. Strawberry Singh has a nice article up titled 10 Years of Second Life Fashion. Damn. She has always looked good. Click the image and jump over to Flickr. Read the comments. Check out her albums. Sansar News Blog has the article, Special Torley-Inspired Scavenger Hunt Edition of Atlas Hopping with Berry and Drax, Saturday, January 6th at 11 a.m. PST. Yeah, that whole thing is the title. Posted in ADITI, Bizzare, Firestorm, SANSAR, Second Life. Tagged Climate. For NASA warming is a $2± billion a year business, from a $200 billion a year budget. There has been no government money for any climate study that does not include warming for the last 20 (?) years. The NASA budget is currently being decided by the US House of Representatives. The Senate has had their say passing a NASA bill: S.442. What should you tell your representative? Spend more? Less? Close NASA Earth Sciences (ES)? Save ES? You’ll find the information about what the House is doing in the House’s appropriations bill, a continuing measure as Pres. Obama stopped preparing a Federal budget for submission to and approval by Congress as required by US Law years ago. We now stagger from financial crisis to crisis. A point in deciding what to tell your representative would be to look at the facts of what NASA ES has been doing. Francis Menton has been publishing a series of articles detailing just that. Francis’ latest (14th) article is about how NASA has been adjusting the temperatures from a weather observatory near his home located at Falls Village (Town of Canaan), Connecticut. It is worth reading before deciding. Posted in Bizzare, Philosophy, Scams. Tagged Climate, NASA. I think this is an amazing thing for Scott Adams, the author of Dilbert, to do. Scott is not what I would consider a climate skeptic. But, his challenge is amazingly simple and direct. This is the type of thinking I love. His humor about corporate life and management is often too true. See his: The Climate Science Challenge. My challenge for warmers is to find something wrong with his challenge and explain why it is wrong. Posted in Philosophy. Tagged Climate. There is a lot of climate news we don’t hear about in the mainstream media. Finding reporters without an agenda willing to report facts going against their thinking is difficult. What I am betting you haven’t heard is this new information: Deserts ‘greening’ from rising carbon dioxide. Posted in Interesting, Philosophy. Tagged Climate, Warming. Is There Climate Warming Fraud? For support of the UN’s IPCC claim that manmade CO2 is warming the world the UN needs to be able to measure temperature change and show warming. But, what if someone were faking the data? We have a new study of the temperature data records used to show warming and what happens if you compare the current data to 2010 data. What does it show? Why are Warmers having so much trouble with Skeptics? Anthropomorphic Global Warming has been an ongoing debate since the mid 1970’s and for this generation since the 1990’s. Low information voters tend to be warmers and high information voters tend to be skeptics. Presumably that is because high information people do more research and dig below the surface. Low information people tend to accept the easy to find and hear information. At least that is my personal experience. What do you actually know about the global warming debate? A good summary is here: New studies flip climate-change notions upside down. They don’t provide the supporting links. But anyone Googling the points mentioned is likely to generate a growing collection of questions. But, facts seldom change minds… and common sense long ago left the arena. I have often found that figuring out whether a cause is worthy is just a matter of looking at the people supporting it. It is definitely a consideration for whether I’ll participate or not. I had no problem deciding to oppose ISIS at every level. A quick, but stomach churning, look at the search results for ISIS killing pictures should do it for any sane person. The philosophy of a group of people sets the limits to which individuals in the group will go. Yet, every group has its wackadooles, the crazy out of touch people we find annoying but not overly dangerous. Groups also have some number of fanatics and radicals that range from crazy annoying to deadly dangerous. So, painting any group with a broad brush is usually misleading. Christian charity workers help people all over the world. That doesn’t prove the existence of God, the accuracy of their beliefs, or provide a guarantee of each Christian’s character, but the general quality of the people and their devotion to a cause and how they treat people suggests they have a generally beneficial belief system and cause. It begs the question what is it about that belief system that leads so many onto caring about their fellow man? 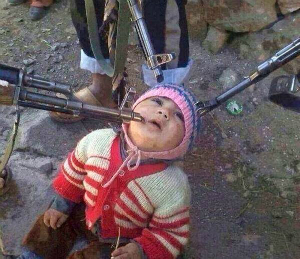 Pic from Catholic.org – Actual image issued by ISIS.